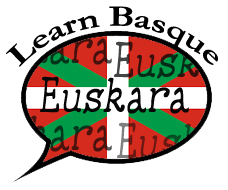 The North American Basque Organizations held its 2017 winter meeting on February 11th, hosted by the Basque Club of Utah. 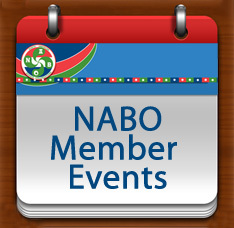 Several items were discussed at the meeting including several opportunities for NABO clubs and their members, including: Udaleku, upcoming dance workshops and summer convention in Buffalo, WY. Udaleku is NABO's summer culture camp for children between the ages of 10-15. This year's camp will be held in Chino, CA, June 25-July 7th. If you are interested in sending your children to camp, sign up will take place on March 1st at 6pm PST. The application will be available on the Udaleku page at that time. Camp fills quickly so everyone is encouraged to be ready on the first. NABO's dance chair, John Ysursa, also announced that new dance workshop opportunities are available this spring. Iñaki Goirizelaia, former president of the University of the Basque Country, is currently in Boise on sabbatical. As a former dance instructor in his hometown, he has offered himself to conduct dance workshops while here. If you are interested in hosting one in your area or town, please contact John. Representatives from the Big Horn Basque Club also attended the meeting to share news and updates on this year's convention to be held there July 21-24, 2017. Hotel rooms are going fast, and so if you are planning on attending the event, you are encouraged to make reservations ASAP. They have also created a dedicated website for the event that can be found here. There you'll find information on the weekend's events, hotels, dining and contact information. Another subject discussed was the revolving loan that is also known as CARL – Cultural Activities Revolving Loan. This fund was established to provide seed money for cultural projects and activities in clubs who may not have enough capital to front all the costs on their own. To date, no club has taken advantage of this opportunity. If your club may need help with future activities, complete information can be found here or by emailing loan@nabasque.eus. The Boise Basque Museum and Cultural Center is inaugurating a new exhibit called "The Time of Lambing and Shearing," on Thursday, February 23rd at 6pm. 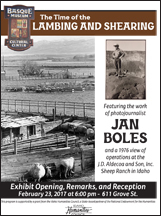 The exhibit features the work of photojournalist Jan Boles, and a look at what the sheep industry was like on the J.D. Aldecoa and Son, Inc. Sheep Ranch in Idaho in 1976. 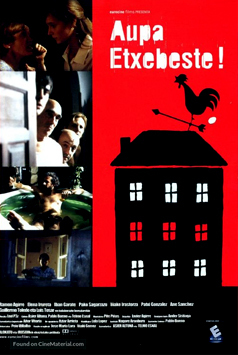 Jan will attend the opening that will also include light refreshments. For more information visit their website. 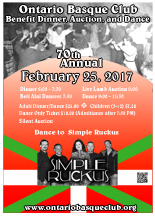 On Saturday, February 25 Four Rivers Cultural Center in Ontario, Oregon will be the site of Ontario Basque Club's 70th Annual Benefit Dance and Dinner. Doors open at 6:00 pm. Dinner will be served until 7:30. The Beti Alai dancers will perform at 7:30 followed by the live lamb auction. There will also be a silent auction. Dance to the Boise band Simple Ruckus until 11:30 pm. Dinner tickets are priced at $25.00 for adults and $7.50 for children ages 3-12. Dance-only tickets will be availble for $10.00 with admittance after 7:30. Tickets may be purchased via Paypal on the club's website or by calling Maria at (208) 739-1837 or Christina at (541) 212-1163.